Make every bulletin board purposeful. The board should aid in the teaching of a concept. 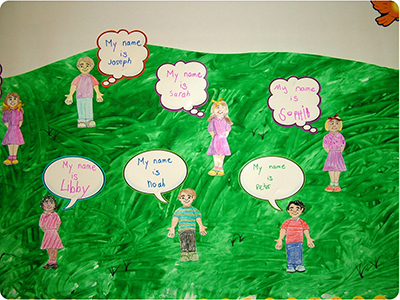 This bulletin board is to reinforce the lesson taught on the importance of names. 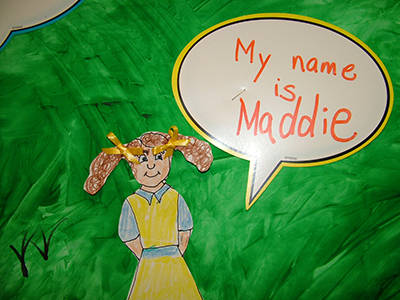 When children help to make or add their own artwork to a bulletin board there is greater learning taking place. Cover top half of bulletin board with white paper. On another sheet of white bulletin paper have children help make the grass with green finger paint. Place a large sheet of white paper from a roll on a large table. Place green finger paint on a foiled covered paper plate and have each child place hands in the paint then add to the picture. When the paper is covered with paint allow to thoroughly dry. When dry begin at one end and cut out the hills making sure your paper is long enough to fit the bulletin board. Staple this hand painted grass to the bulletin board. Pass out the girl and boy figures (pdf available below) for children to color. 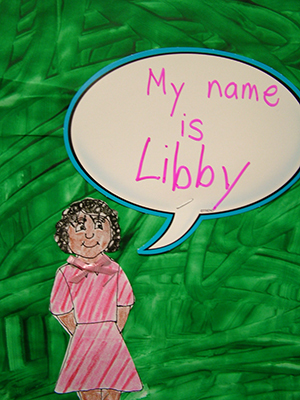 Before children color these figures describe how each person is different in many ways. See examples below on how to make various hairstyles to match the child’s appearance. After collecting the coloring page you could glue each child’s face photo to their coloring but if you do this tell the child ahead of time what you will be doing. Be creative; add ribbons to hair, texture to shirts, whatever you desire. Cut out each figure and place on grass. Make cartoon bubbles to introduce each person. Example…My name is Melissa. Look up each child’s name in a baby name book or on the internet to find meanings to discuss at a later time. Have one student color the Bible (pdf available below) and place a caption bubble after it as noted in photos. This bulletin board can introduce your unit lessons on the names of God.